Drobo protects you from one or two simultaneous drive failures and can expand capacity on the fly by adding new drives, or replacing smaller drives with larger ones. All this, with zero downtime made possible by its BeyondRAID technology. We can provide high performance NAS solutions for small to medium businesses. Whether you want a simple solution to share files between your users or a high availability solution with automatic failover we have the experience needed to support your business. Time Machine is a great backup solution but some businesses need more. We can help protect your important business data with high performance tape backups. Tape backups provide reliable long lasting backups of your data that last up to 30 years. We can provide super fast Thunderbolt tape backups of your data. Running out of space on your Mac or want the peace of mind of reliable RAID storage? We can provide a range of high performance storage solutions for your Mac. 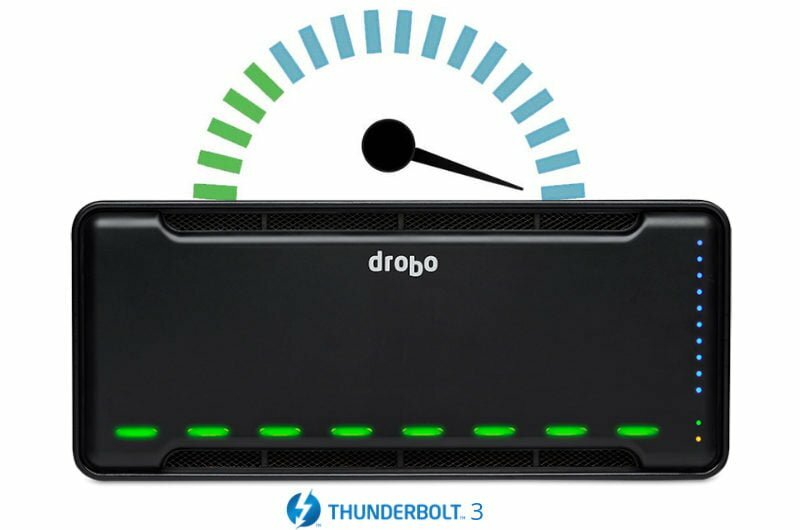 We recommend Drobo as a high performance Thunderbolt 3 connected storage solution. We can help setup your new device and migrate your data. Looking for a cloud storage solution? We support a range of cloud solutions and can help select the the right one for your business.